My Nana and Grandad Brian and Cynthia Bishop have owned the Club Hotel for fifteen years. The Club Hotel was built in 1888. That’s 125 years ago. 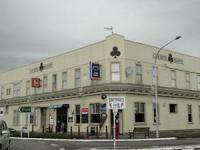 The Club Hotel was called Wellington Manawatu Club Hotel. Mr Bishop said the Club Hotel was burnt down in 1901 and was rebuilt in 1917. There are nine rooms at the top of the Club Hotel for visitors to stay in. In the early days the Club Hotel was where many different people came to dance, drink,and have a good time. It was a place for everyone to get together. Some of these people were called bush whackers. A bush whacker is someone who lives in the bush. We know this because Shannon was once surrounded by bush and you could only get here by train. Everything came on the railway. Food, clothes, furniture, farm animals and things needed to live in Shannon. There was also a group of people called flaxies. The flaxies were the people who cut and worked with flax to export because Shannon was well known for lots and lots of flax. Our Harakeke was stripped and used to make rope. We have found some interesting information about the Club Hotel that we are now able to share with others. We have enjoyed finding out about where we live and where we come from. Team effort by Aotea (Year 6) and C.J. (Year 5). The Wellington Manawatu Club Hotel was built in 1888 for T G MaCarthy. The hotel was opened a year after Shannon’s Albion Tavern up the road was opened. Sadly the first Wellington Manawatu Hotel burnt down in 1901 and because of this fire the original sign is no longer shown on the top of the buildings outside walls. T.G. MacCarthy died in 1912 and the first licensee was G.O. Loughlin. Michael Moynihan took over the license in 1892. The Wellington Manawatu Club Hotel’s name was shortened to the Club Hotel in 1911 when it was rebuilt. In the early days women weren't allowed to drink in bars. The beer used to be stored in flagons. On hot days the pub patrons sometimes used the horse troughs for a dipping cooling down pool. The horse troughs have disappeared but the stables still remain. The horse stables are classified as a historical building. Historical buildings cannot be demolished. The stables that were once used for horses, now store firewood. An old beer tank can be found in the stables. This beer tank was available for people to take home for parties. Back in the old days, there were bars that were only for two or three people. These bars were known as snug bars. The Club Hotel used to have a one hundred metre water pipe going way down underground. The water, they say, was beautiful and fresh. Some of this water also fed the horse troughs but most of it went out into our town. The towns people of Shannon would come with their jugs to fill them with this wonderful water. The Club Hotel has seen many changes. The paint jobs are different from what they used to be and it has been refurnished. Today’s proprietors Mr Brian and Mrs Cynthia Bishop employ three full time workers, one part time worker and one cook. We were fortunate to interview Mr and Mrs Bishop and here is what we learned. In the Club Hotel there is a trapdoor cut into the floor. We opened the trap door with the help of the proprietor Mr Brian Bishop. There was an old ladder which led down under the bar to the cellar. This is where the beer is stored. We saw a frozen pipe that helps to keep the beer cold. There was only one tank left. It is made of scrap metal. There is a chiller that has crates and boxes of alcohol in it. The chiller is very cold. The accommodation area is upstairs. It has eight rooms, one bathroom, a living room and fire escape. There are many files and a safe kept in the hotel. If anyone tries to break into the safe an alarm goes off. Mrs Bishop explained that, “The alarm is very noisy and you can go deaf just listening to it!” The Club Hotel has a paddock where horses can run around. Sometimes it is also used for small bonfires. The Club Hotel has a courtesy van that takes people home if they are unable to find a way home by themselves. The Hotel also supports the Shannon Rugby Club. Ms Tania Edlin who works at The Club Hotel agrees that the prices for drinks has risen. She also said that the age restriction on buying alcohol has decreased from twenty years old to eighteen years. If a worker is selling alcohol to a citizen under the legal age, then they will be fined approximately five to ten thousand dollars. During our interview at the Club Hotel we had the privilege of meeting the great great great grandson of Mr Michael Moynihan. This gentleman had never been in the Club Hotel before. The Club Hotel has had many stories to tell and we have had the privilege to listen to and learn about them. We would also like to thank the author of the book From Bush and Swamp, Mrs Marjorie Law. Team effort by Danien (Year 7) and Brayden (Year 7).